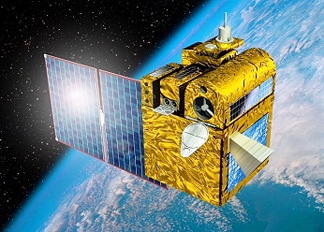 PRISMA satellites "Mango" and "Tango"
[SatNews] The two PRISMA satellites to be launched next week feature a Thales Alenia Space's technology that determines the two satellites’ relative positions to within 1 centimeter, and their relative attitudes to within 1 degree. PRISMA (Prototype Research Instruments and Space Mission technology Advancement) is a Swedish-led multilateral program designed to validate various inter-satellite approach and rendezvous techniques, in particular key enabling technologies for future formation flying missions. Thales Alenia Space plants in France (Toulouse) and Spain have delivered the RF metrology subsystem (FFRF) for three S-band antennas, comprising two electronics assemblies (9 and 10 kg, respectively, each one integrated in each of the two satellites). The mission is comprised of two satellites, the highly maneuverable “Mango”, and the inert “Tango”, to be placed into the same orbit. “Mango” will carry out the approach and distancing maneuvers, while the smaller, lighter “Tango” will follow its initial trajectory. According to Nicolas Wilhelm, product manager at Thales Alenia Space, “The RF metrology subsystem is a key to future formation flying missions. It provides the relative positions of the satellites during the approach and formation setup phases, and also delivers the accuracy needed for the acquisition of the fine optical metrology stage.” PRISMA is a Swedish program financed by the Swedish space agency SNSB, with the Swedish Space Corporation (SSC) as system and satellite prime contractor. It was developed on a multilateral basis with French space agency CNES, Spanish Center for the Development of Industrial Technology CDTI, German aerospace center DLR and the Danish Technical University (DTU). 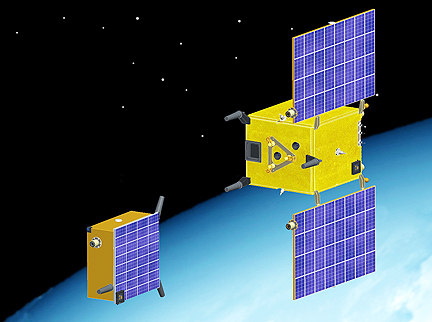 The two PRISMA satellites are scheduled for launch by a Dniepr rocket from Yasny, Russia, on June 15, 2010, with a co-passenger — the Picard satellite, which will be dedicated to sun observation. They will be positioned in low, Sun-synchronous orbit at an altitude of about 710 km, for a mission lasting about ten months.